The largest and most affordable Online Tricycle Adults Shop! Tricycle Adults shop the largest and most affordable! Do you want to buy an Adults Tricycle online? 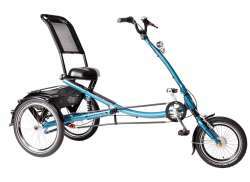 Hollandbikeshop.com has the Tricycles for Adults you're looking for. A three-wheeled bicycle is more stable than a bicycle with two wheels. That's why Tricycles for Adults are very suitable for people with a physical disability who are able to cycle, but struggle with keeping their balance on two wheels. Unlike tricycles for children, Adult Tricycles have a separate bottom bracket that is connected to the rear axle via a chain. 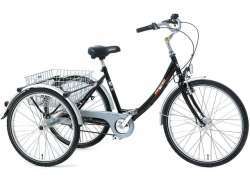 At Hollandbikeshop.com you can find a wide choice of Tricycles for Adults by brands like PFAU-Tec and Pfiff. 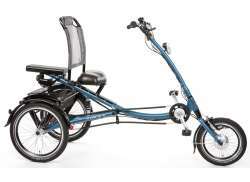 In our wide Bicycle range on Hollandbikeshop.com you will also find Tricycles for Adults, in various colors, sizes and models, like Adult Tricycles with two rear wheels and one front wheel, but also Adult Tricycles with one rear wheel and two front wheels. You'll definitely find the Tricycle for Adults you're looking for. 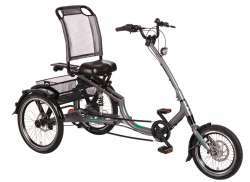 Hollandbikeshop.com is dealer of Adults Tricycles and has a large and affordable range. We also often have Tricycles for Adults on sale or in our outlet, so keep an eye on our sale button. The largest and most affordable online Tricycle Adults shop!